Rya McKinley Kiernan, 4, center, looks at her grandmother, Margaret Kiernan, after being asked what type of tea she would like at the historic Bishop House on East Second Street on Tuesday. Afternoon tea was served to celebrate the Cadoma Foundation's ownership of the home. Photo by KERRY HULLER, Star-Tribune. Part three of the three course Devonshire tea is served, the first part being sandwiches followed by the second part, scones. Photo by KERRY HULLER, Star-Tribune. The ladies seated at the lace-clothed table in the formal dining room sipped tea from china cups, ate delicious tiny sandwiches, marveled over warm scones with Devonshire cream and talked about husbands, children and impending graduations. While the setting and subject matter certainly might have been the same any time during the 1900s, the scene actually brightened an otherwise gloomy Thursday afternoon - in 2008. Nearly 10 years after the death of its final, full-time resident, The Historic Bishop Home, 818 E. Second St., hosted the first event in what organizers hope is a series of many to share the treasured red brick home with the public. 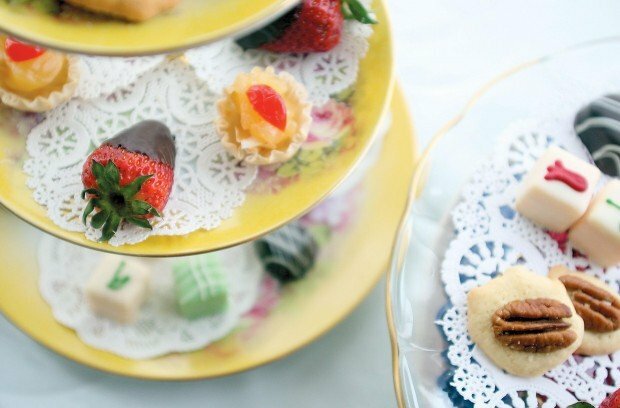 Planned to celebrate the home's transfer of ownership from the Bishop family to the nonprofit Cadoma Foundation, the three teas scheduled this week sold out quickly. Other public events will take place before summer's end, however, including a vintage fashion show and tea hosted by ladies' clothier Margaret Kiernan sometime in June. The Bishop Home was built in 1907 by Casper postmaster Marvin Bishop, who with his wife, Leona, raised their family of seven girls (one of whom died in infancy) and three boys there. Their granddaughter, Susan Bishop, is president of the Cadoma Foundation, which takes its name from an original homestead and railroad siding near the Casper airport that housed large sheep shearing pens in the early 1900s. Susan Bishop's mother, well-known Casper realtor Mary Bishop, is the vice president of the foundation. Her husband, Jerome, was one of Marvin and Leona's three sons. Because the home was lived in nearly continuously by members of one family, it retains many of the original furnishings and authenticity. Four of Susan's aunts, Lucile, Pink, Lillian and Marguerite, lived in the home at one time, and Lucile remained there from birth until her death in October 1998. Susan Bishop says the foundation's purpose is actually twofold. "There is somewhat of a void in historic preservation," she said. "We're trying to fill that niche. We want to make sure that historic properties continue to exist. We can do that by purchasing the property, as we have here, or helping the owners get them ready for historic preservation." The Bishop Home is ready now to accept private rentals for up to 25 people, ideal for intimate weddings, bridal showers, baby showers or other small celebrations. The house rents for a minimum of $125, but Bishop and her staff will make all of the arrangements, including food, for an additional fee. Susan Bishop explains that all events must be catered, "because this is still a 1920s kitchen," she said. 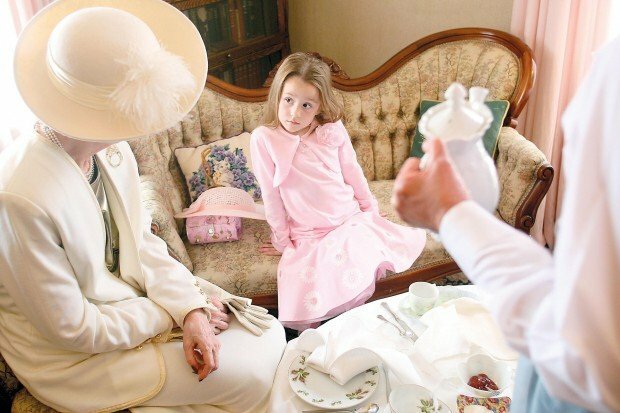 While Carolyn Deuel tickled the piano keys, Margaret Kiernan, resplendent in an ivory hat and suit, sipped tea in the sitting room as her granddaughter, Rya McKinley Kiernan, 4, of Denver, enjoyed the event with her YaYa. Red Hatters Joanie Dunlap, Della Works and Eileen Peck enjoyed the afternoon seated in the formal living room. "I thought there would be more hats here," Works said. With or without a hat, Thursday's event was elegant just the same.